Due to the tense diplomatic relations and the U.S. economic sanctions, the Turkish lira has hit yet another all-time low against the US dollar, affecting other European countries as well. In his interview with Reuters, President Donald Trump stated that there wouldn’t be any concessions to Turkey until the detained American pastor is not free again, he added that he was not concerned that retaliatory tariffs he imposed would have a riffling effect and hurt the European economy. Trump has imposed tariffs on imports of Turkish steel and aluminum in response to Erdogan's refusal to free Brunson, raising concerns about economic damage in Europe. "I'm not concerned at all. I'm not concerned. This is the proper thing to do," he said when asked about the potential damage to other economies. Even though some European countries already expressed their concerns about the US sanctions against Turkey, since it might let massive damage on the European economy, a new analysis by Berenberg Bank sees the small long-term impact of high Turkish inflation and low-interest rates on eurozone gross domestic product (GDP) growth. "Even if eurozone goods exports to Turkey were to fall by 20 percent, this would subtract no more than 0.1 percentage point from growth in the big eurozone," says the report. Turkey's annual GDP, which is around ˆ750 billion ($860 billion), is only equivalent to 6.5 percent of the euro zone's GDP. However this is four times larger than that of Greece, it is still "less than half the size of the Italian economy, despite Turkey's larger population of around 80 million versus around 60 million for Italy," says the analysis. 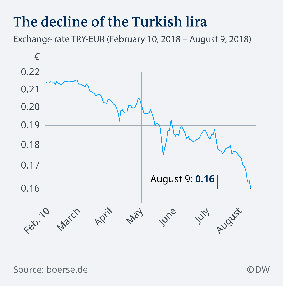 It can be assumed that Lira crisis will have short and long-term impacts on the European economy, but it won’t be tough for Europe to cope with it. Even though the Turkish economy shrank in its aftermath, eurozone confidence remained stable, and credit growth also rose during the period. Even though most of the European countries can cope with the influences of Turkey's financial crisis, it is probable that Georgia will be affected. According to the General Census Data 2014, Turkey is the third largest country, where most of the Georgian immigrants are present. According to the Ministry of Internal Affairs of Turkey, in 2016- 18,511 citizens of Georgia owned a residence permit. Majority of these were labor (8,014) or short-term (7,478) residence permits, and in 2,477 cases the residence permit has been issued for the unification of the family. Thousands of Georgians are working in Turkey to help their families in Georgia. In many cases these people are the only source of income for their families; therefore the economic crisis in Turkey can affect Georgia, more than any other EU zone country. Lira crisis made a life for Georgian emigrants in Turkey harder and as they told various Georgian news agencies, most of Georgians working in Turkey, are already thinking about leaving the country.